We are engaged in manufacturing, exporting and supplying supreme quality Instrument Cabinet. We offer Instrument Cabinet to our clients. - Frame Work Constructed with Heavy duty Ms Steel Sheet. - Two Glass Doors Available With Individual Key Locking. - Sheet Panel on back side. - Five shelves, door & two side of 5mm thick fine glass. Description: CNC machine pressed & bent CRCA sheet cabinet. Four adjustable CNC machine pressed Stainless steel shelves making five compartments. Front door fitted with transparent glass/acrylic sheet. 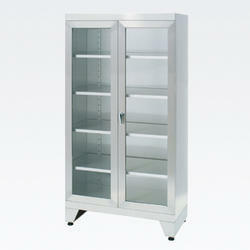 We bring forth superior quality Hospital Instrument Cabinet with accurate dimension. 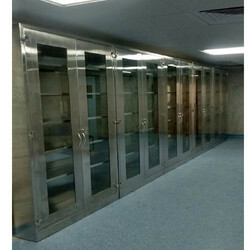 These Hospital Instrument Cabinets are made using high quality materials and are highly durable. Our Hospital Instrument Cabinets have three sides and single glass panel. Our Hospital Instrument Cabinet is available in fine pretreated and oven baked finish and remains in use for years. Instrument cabinet with four glass horizontal partitions and glass fitted lockable doors, pre- treated, epoxy coated finish. Overall Size: 120H × 30 D × 60 W Cm. - Size: 30"x 13" x H-60"
We are engaged in the industry for successfully handling the customer requirements by manufacturing and supplying instrument cabinet. Owing to our experienced team, we design these systems with utmost care and precision. Further, their exclusive designs also make these appreciated among our clients.